CHARLOTTE— Old Carolina blues reigned down for the defending national champion No. 2 seed North Carolina Tar Heels on Sunday afternoon. In what was setup as a less difficult road to the ‘Sweet 16’ turned into a home nightmare for Roy Williams team, losing 86-65 to the No. 7-seeded Texas A&M Aggies. A matchup of UNC’s fast paced offense against the bigger A&M lineup started out going in favor the higher seeded home team, quickly morphed into a blowout. The Tar Heels took their largest lead of the game by a margin of seven points, 20-13, with 11:37 left in the first half and wouldn’t be out in front again. UNC gave up a season high 14-point lead, 42-28, to the Aggies at halftime behind the frontcourt of Tyler Davis and Robert Williams. The Aggies big men combined for 17 points and 14 rebounds in the first 20 minutes on the floor and would finish the contest with 26 points, 22 rebounds and five blocks. “We just played like it was 0-0, like it was the first half keep it up the whole game,” Williams said. The Tar Heels’ inconsistency was their Achilles the entire 40 minutes; shooting a low 33.3 percent (26-of-78) including 6-for-31 from beyond the arc and two made three’s in the first half alone. Despite not finding a decent range, Joel Berry II lead all scorer with 21 points and five rebounds in a losing effort. “I can’t think of any time where I’m sadder,” Williams said fighting back tears after the game. 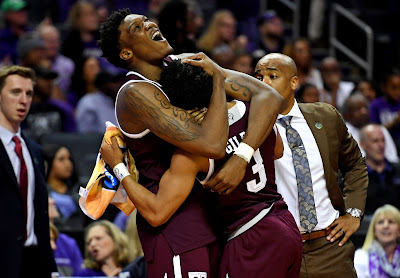 Coach Billy Kennedy and Texas A&M advances to their second sweet 16 appearance in the last three years; losing to Oklahoma that year by a score of 77-63 in Anaheim, Calif. This time, the Aggies head back west to Los Angeles for a shot at redemption to play for a spot in the Elite Eight against third-seeded Michigan. If the Aggies can pull off a victory over the Wolverines, it would be the deepest run in school history.